Yes, the name sounds strange. “Kinematic Character”. What is that? The reason for the name is that, when physics engines came out, they were called “Dynamics” engines (because they dealt mainly with collision responses). Many attempts were made to create a character controller using the dynamics engines, but it wasn’t as easy as it seemed. Godot has one of the best implementations of dynamic character controller you can find (as it can be seen in the 2d/platformer demo), but using it requires a considerable level of skill and understanding of physics engines (or a lot of patience with trial and error). Some physics engines, such as Havok seem to swear by dynamic character controllers as the best option, while others (PhysX) would rather promote the kinematic one. A dynamic character controller uses a rigid body with an infinite inertia tensor. Basically, it’s a rigid body that can’t rotate. Physics engines always let objects collide, then solve their collisions all together. This makes dynamic character controllers able to interact with other physics objects seamlessly (as seen in the platformer demo), however these interactions are not always predictable. Collisions can also take more than one frame to be solved, so a few collisions may seem to displace a tiny bit. Those problems can be fixed, but require a certain amount of skill. A kinematic character controller is assumed to always begin in a non-colliding state, and will always move to a non colliding state. If it starts in a colliding state, it will try to free itself (like rigid bodies do), but this is the exception, not the rule. This makes their control and motion a lot more predictable and easier to program. However, as a downside, they can’t directly interact with other physics objects (unless done by hand in code). This short tutorial will focus on the kinematic character controller. Basically, the old-school way of handling collisions (which is not necessarily simpler under the hood, but well hidden and presented as a nice and simple API). To manage the logic of a kinematic body or character, it is always advised to use physics process, because it’s called before physics step and its execution is in sync with physics server, also it is called the same amount of times per second, always. This makes physics and motion calculation work in a more predictable way than using regular process, which might have spikes or lose precision if the frame rate is too high or too low. Note: As mentioned before in the physics tutorial, the physics engine can’t handle scale on most types of shapes (only collision polygons, planes and segments work), so always change the parameters (such as radius) of the shape instead of scaling it. The same is also true for the kinematic/rigid/static bodies themselves, as their scale affects the shape scale. Now, create a script for the character, the one used as an example above should work as a base. 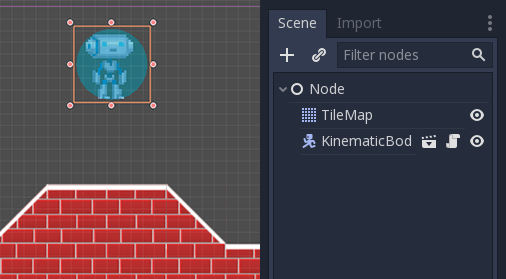 Finally, instance that character scene in the tilemap, and make the map scene the main one, so it runs when pressing play. Go back to the character scene, and open the script, the magic begins now! Kinematic body will do nothing by default, but it has a useful function called KinematicBody2D.move_and_collide(). This function takes a Vector2 as an argument, and tries to apply that motion to the kinematic body. If a collision happens, it stops right at the moment of the collision. The result is that the character will move, but stop right when hitting the floor. Pretty cool, huh? Now the character falls smoothly. Let’s make it walk to the sides, left and right when touching the directional keys. Remember that the values being used (for speed at least) are pixels/second. # We don't need to multiply velocity by delta because "move_and_slide" already takes delta time into account. # The second parameter of "move_and_slide" is the normal pointing up. # In the case of a 2D platformer, in Godot, upward is negative y, which translates to -1 as a normal. // We don't need to multiply velocity by delta because "MoveAndSlide" already takes delta time into account. // The second parameter of "MoveAndSlide" is the normal pointing up. // In the case of a 2D platformer, in Godot, upward is negative y, which translates to -1 as a normal. This is a good starting point for a platformer. 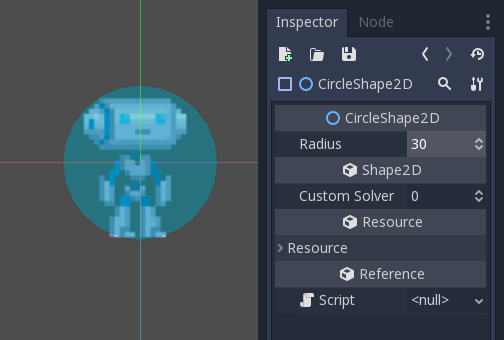 A more complete demo can be found in the demo zip distributed with the engine, or in the https://github.com/godotengine/godot-demo-projects/tree/master/2d/kinematic_character.